Most industry members are aware that glass often enhances the appearance of rubies that have been heated. Recently Ahmadijan Abduriyim of the Gemmological Association of All Japan (GAAJ) reported that unheated rubies were being treated by a glass fracture filling technique similar to that applied to diamonds (2004). In April of 2004 the GAAJ sent a sample to the AGTA-GTC. Our tests confirmed: Flash effects within the rubies similar to those found within glass filled diamonds and resin filled emerald. EDXRF also confirmed the presence of leaded glass in the fracture of the ruby. The prevalence of this treatment is not known. However, a 16-carat ruby was submitted for a report to the AGTA laboratory in June 2004, which had been treated by this method. Members and clients should be aware that rubies treated by this technique are now present in the US market. (2004), GAAJ Lab Alert: Lead Glass Impregnated Ruby. GAAJ Research Laboratory. 2004. Our industry, which acknowledges the beauty and rarity of the various Burmese gemstones, has historically offered aid to this troubled land through our involvement with and trade of these products. Yet in the face of the ongoing oppression by a brutal military government, compounded by the current US trade embargo against all Burmese goods including gemstones, we must offer these people our financial support in their time of need. We’ve heard a lot about the industry in relation to conflict diamonds, tanzanite, and terrorism. Through this project, the industry can do something positive. By offering aid to Burmese people of all ethnic backgrounds and religions, our project will help fund and support locally run projects that promote health, education and leadership development. Members of the industry can give donations, which the project will send to the Foundation for the People of Burma, a non-profit humanitarian organization based in California. Jewellery News Asia has just reported that Henry Hänni’s Swiss Gemmological Institute (SSEF) has developed an inexpensive method for testing treated sapphires for the presence of beryllium. They plan to begin offering this service immediately through their Basel laboratory, as well as at on-site testing in various locations around the world. The S.H.A.N. News Agency has recently reported on what may be a new ruby mine in Burma’s Shan State. 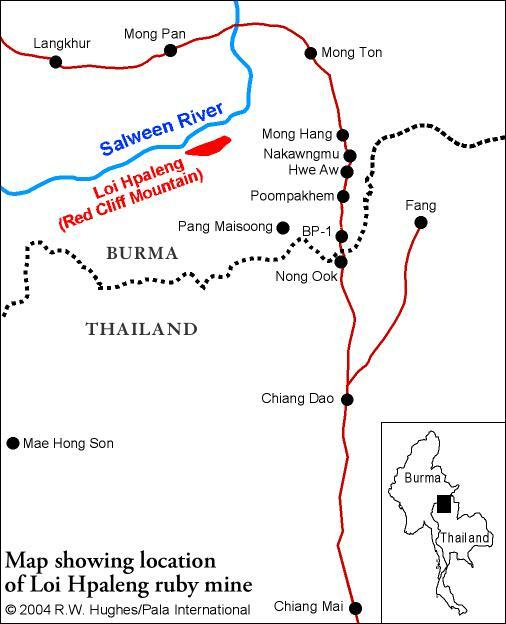 Located at Loi Hpaleng (“Red Cliff Mountain”), on the southern banks of the Salween river, the deposit is said to have been discovered over two years ago. Ja Pikoi, a local militia leader had been quietly digging and selling the gems mixed into parcels from Möng Hsu (Maing Hsu). Map showing the location of the Loi Hpaleng ruby mine in Burma’s eastern Shan State. Suspicions were raised when it was noticed that Ja Pikoi was displaying unusual wealth without dealing in drugs. Eventually word filtered down to the capital, which dispatched both troops to keep prospectors out, and a team of nine gem experts to examine the mines. They arrived on September 30, 2003. “Samples that the experts obtained melted when they were heated, unlike Monghsu stones,” one of the gem traders who also occasionally deal in drugs told S.H.A.N. Loi Hpaleng, “the mountain of red cliff”, is located west of the Mongton-Chiangmai highway and became known to the Burmese commanders after a local militia leader, Ja Pikoi, became unusually rich without noticeable dealings in drugs like his peers. On 30 September, the gem specialists arrived under heavy security to investigate. Ja Pikoi, leader of the militia force at Hwe Aw, 21 miles north of the Chiangmai border, has apparently escaped persecution by Rangoon for the unfortunate incident and has been allowed to carry on with his duties. “But the fact is that while his fellow militia chiefs who deal in drugs are facing financial hardships due to suppression in Thailand, he appears to have remain unaffected,” observed a local trader. Apart from Mogok and Monghsu, another rubyland in Panglong in Namtu township, northern Shan State, was reported to have been located. However, the discovery has never been publicized and the place remains off-limits to non-military members, said a Shan ceasefire officer. Troops from the United Wa State Army's 171st Military Region of Wei Hsuehkang has since 1 March, taken the Loi Hpaleng range, opposite Chiang Mai, that was reportedly “crammed” with red ruby stones, a fact that was yet to be officially substantiated by Rangoon. The reasons for the Wa zeal were Bao Youxiang, President of the Wa, and Wei Hsuehkang, he said. “Wei particularly thought that the place might well turn out to be an ideal front for all their drug activities,” he quoted a Wa officer as saying. A team of specialists visited the range in October under heavy security, soon after stories began to circulated that a Lahu militia leader had discovered rubies there, but nothing ever came out of it. In the meantime, the news of the “big find” has appeared to have drawn enterprising people to the area. “Some are already offering cheap rubies from the Mong Hsu gemland for sale as Hpaleng rubies,” said a trader from Chiang Mai’s Fang district. So does Burma really have a new ruby mine or two? Discusssion with our sources in Burma suggest it is just too early to say. Sept. 18: Ruby from Longdido! November 13, 2003: Update New Blue Sapphire Treatment? October 9, 2003: New Blue Sapphire Treatment? The American Gem Trade Association (AGTA) has just released an update regarding blue sapphires (archived here) that appear to be treated by a new high-temperature heating technique. The exact mechanism of this treatment remains uncertain, but a number of stones in sizes ranging from 2 to 17 cts. have been seen over the past several months. The major identifying feature of these stones is a blue core surrounded by a diffuse colorless or near colorless skin. This is best observed by immersion in methylene iodide (di-iodomethane) with a diffuse white plastic filter between the immersion cell and light source in the microscope. Note that all stones placed table down in an immersion cell will show some lightening of color at the girdle, since the stone is thinner at the girdle. But stones treated by this new process show a distinctive colorless rim that penetrates well into the gem, unlike the normal gradual lightening of color towards the girdle in untreated stones. The American Gem Society (AGS) recently announced final nominees for the American Gem Society (AGS) Richard T. Liddicoat Journalism Awards. The RTL awards were developed in remembrance of Richard T. Liddicoat to honor journalists that have made exceptional contributions to the understanding of gemology, as well as AGS ideals of ethics, education and consumer protection. 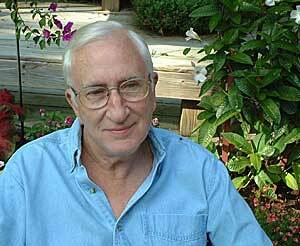 Richard Hughes and Pala associate, Edward Boehm, are among the nominees. Myanmar’s state-run news agency has reported that Burma’s latest gem auction has netted US$23 million. Xinhua News Agency, March 24, 2003: Myanmar has fetched a total of 23.32 million US dollars from sale of locally-produced quality gems through competitive biddings at an annual gems emporium which ended here Sunday evening. Through tender and competitive bidding systems, of the 1,423 jade lots displayed, 446 were sold, while of the 219 gems lots, 48 were sold, and of the 224 pearl lots, 16 were sold at the 40th annual gems emporium. Besides, through fixed price system, 1.44 million dollars worth of jade figurines, jewelry, gems and jade lots were sold. Although the proceeds from this year’s gems emporium could not break the past highest record of 30.7 million dollars gained in the event held last November, it was registered as near to the second highest sale of 24.17 million dollars earned in the March annual one in 2000. The nine-day state-sponsored gems emporium, which began on March 15, attracted 622 merchants of 246 companies from 18 countries and regions, mostly from China, China’s Hong Kong and Thailand. The number of local gem traders from 162 companies participating in the event reached 440. Myanmar started holding annual gems emporiums in 1964, introducing mid-year ones in addition since 1992 to boost the country’s dollar earning. Since 1964, Myanmar has earned a total of 413.94 million dollars from its gems emporiums as of now, according to official statistics. There are three famous gem lands in Myanmar – Mogok in Mandalay division, Mongshu [Möng Hsu] in Shan state and Phakant [Hpakan] in Kachin state. To develop the gem mining industry, Myanmar enacted the new gemstone law in September 1995, allowing national entrepreneurs to mine, produce, transport and sell finished gemstone and manufactured jewelry at home and abroad. Since April 2000, the government has started mining of gems and jade in joint venture with 10 local private companies under profit sharing basis. The Chanthaburi Gem & Jewelry Association (CGA) has issued a press release regarding the beryllium bulk diffusion of ruby and sapphire. For the first time, a major Thai gem association has committed to full disclosure of gem treatments, including the beryllium bulk diffusion. Indeed, the CGA has not only committed to complete disclosure, but to the expulsion of members who refuse to comply with this policy. As many are aware, this issue has dogged the trade for the past year. We at Pala International are extremely pleased to see this change in attitude. We are also hopeful that treaters/dealers in other countries will display similar professionalism. On a related note, during one of the Tucson press conferences covering this issue, one trade journalist raised the question of how a jeweler would describe beryllium bulk diffusion to a layperson. While enhancement codes such as those used by the AGTA and/or the ICA are sufficient within the trade, they do not arm consumers with the information they need at the time of purchase. In situations where the artificial color layer does not deeply penetrate the gem, that should also be noted. In the summer of 2002, miners in Russia’s Ural Mountains unearthed the find of the century – large quantities of fine demantoid garnet the likes of which have not been seen since the time of the Czars. Pala International is handling the lion’s share of production. Rough will be available in commercial quantities, as will cut stones in a variety of sizes. All will be on exhibit at the AGTA show (Booth #1016–1018) in Tucson, Feb. 5–10, 2003. Stop by and see just how beautiful green can be. 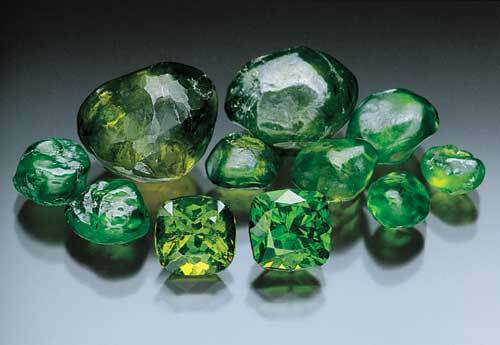 For more on this, see Reds Turn to Green: Russia’s Stunning Demantoid Discovery by William Larson.